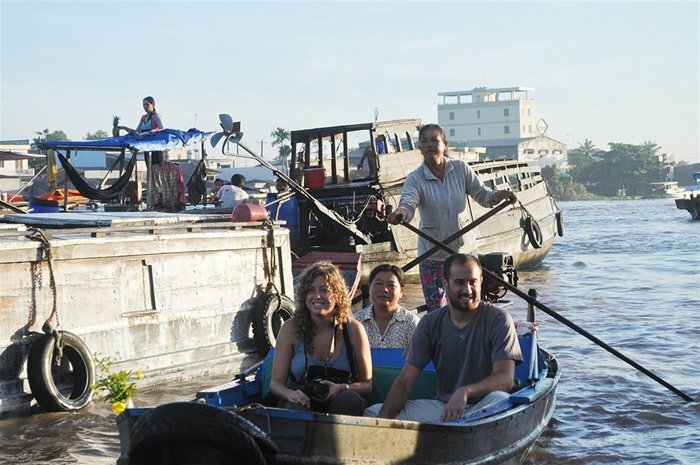 The best way to discover the peaceful and specific beauty of Can Tho is traveling by boat. Don’t be surprised when seeing boats are the best transportation method in Can Tho as in fact, people in Can Tho typically move and work, exchange of good on the surface of water. It is not exaggerating to say that water is the soul and life of this Southern city. 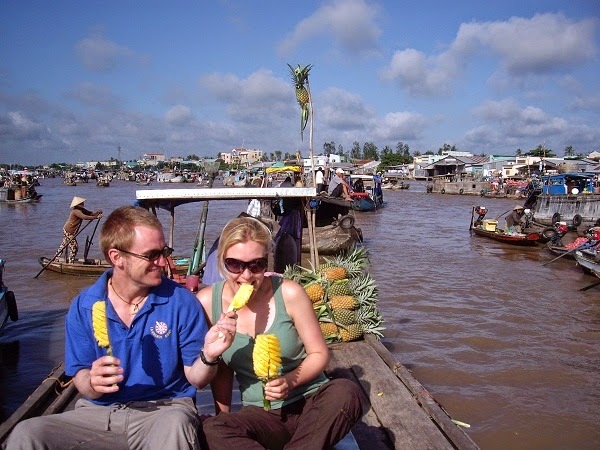 Discovering Can Tho on a boat tour means that you will travel in a network of canals and streams that feed the biggest variety of fruit crops and the sweetest rice in Vietnam. 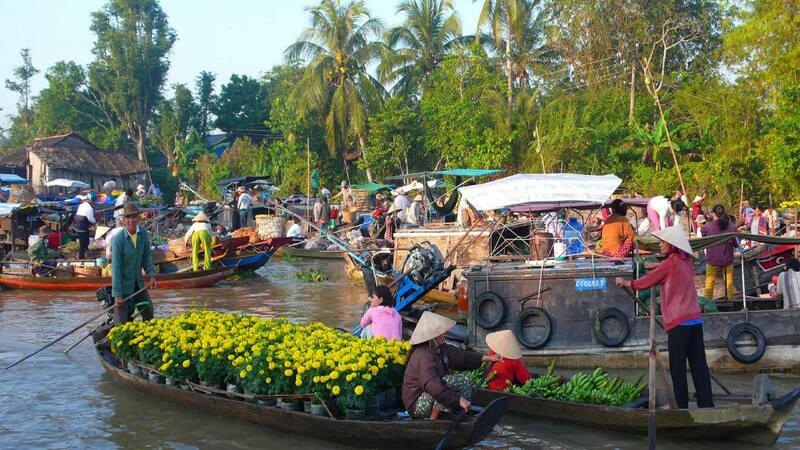 These colorful floating markets epitomize the important role of water in the daily lives of the Mekong Delta residents. Fed by the nutrient-rich water from the Mekong River, the soil in the delta produces the largest variety of vegetables and fruits in Asia. Helping you temporarily forget your busy life with complicated problems and a huge of workload you are having in life, a boat trip in Can Tho will give you a chance to enjoy relaxing time at its best. Though the market is open all day; in the early morning, when bustle of the wholesale traders begins after all the boats gather, is the best time to visit. First-time-visitors are sometimes surprised by the way goods are sold at Cai Rang Market. Unlike in other wet markets, as their cries would be lost on the vastness of the river, the vendors do not shout out to sell their wares. To draw customers’ attention, these vendors tie some of their goods to a tall pole on the deck. This way, customers can see which kinds of food sold at each boat from a distance. In floating markets, you will see a multitude of boats loaded with various kinds of tropical fruits and other colorful eye-catching seasonal products, including dragon fruit, durian, mango, watermelon, pineapple, pumpkin, orange, cucumber. 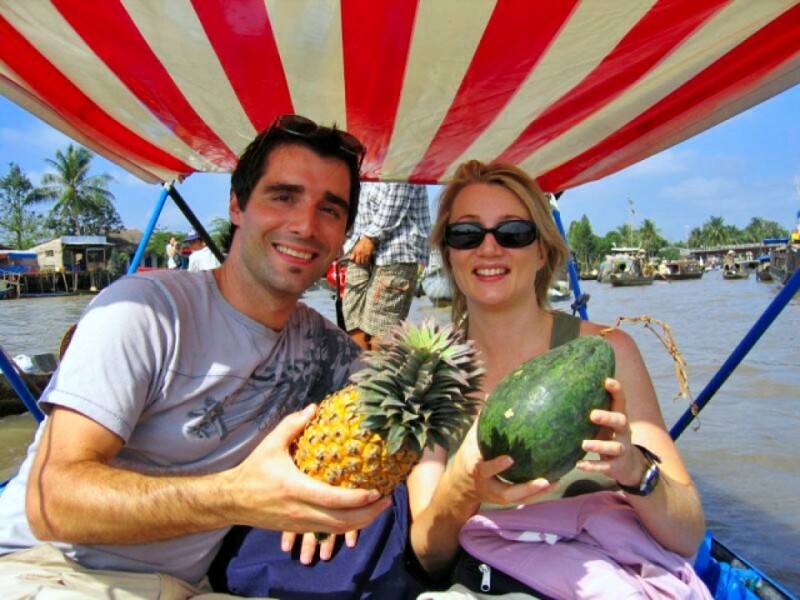 Visiting Can Tho, especially while travelling on the water’s surface, don’t forget to taste these kinds of fruits. It will be an amazing experience. Besides vegetables, fruit and other foodstuffs, while floating on the water in Cai Rang, you can also have breakfast with a bowl of banh canh, hu tieu – Southern style noodles together with a cup of coffee or tea. Immerse yourself in nature while eating, it will be the most memorable breakfast you have ever had. Not only for shopping, but tourists also travel by boat on narrow wooden boat leisurely floating along the river to have a chance to chat with frank country folk ladies, join active trading and enjoy the county watered specialties. When travelling along the small canals, under the shadow of the water coconut trees, which is typical to this region, you will be absolutely impressed by its small waterways and the simple floating houses. Leisurely passing by unique stilt-houses, you will hear the folk song flash away by the local people and see local women washing their hair and their clothes by hand and laughing children swimming in the river. You can even join a small yet interesting show of one of western specific folk called Don Ca Tai Tu (Đờn ca tài tử).